Always attention to detail, technical skills, passion in our work and great attention to customer needs are the strengths that have allowed us to excel in the field of sale of 4 Stencils "Light Speed IRON CROSS" Harder&Steenbeck. Consultando il catalogo di Aerografando you will immediately notice how vast it is and how diversified the model range is Harder & Steenbeck, you will find the best 4 Stencils "Light Speed IRON CROSS" Harder&Steenbeck offers at the best prices on all 4 Stencils "Light Speed IRON CROSS" Harder&Steenbeck of the brands Harder & Steenbeck. The Light Speed stencils have been invented and developped by german Oliver "Disegnio" Paass. Easy to use, precise and time-saving in practice. The Iron Cross is the preferred symbol among bikers. With these templates you will reproduce perfect cross even on helmets or any bended surface. Iron Cross set contains 4 solvent resistant templates with following dimensions: 176 x 176 mm, 138 x 138 mm, 100 x 100 mm e 66.9 x 66.9 mm. Read the reviews of our customers on 4 Stencils "Light Speed IRON CROSS" Harder&Steenbeck of the category Harder & Steenbeck. With us you will find only satisfied customers, thanks to a technical assistance made by those who really know the world Harder & Steenbeck. Review 4 Stencils "Light Speed IRON CROSS" Harder&Steenbeck of the brand Harder & Steenbeck. 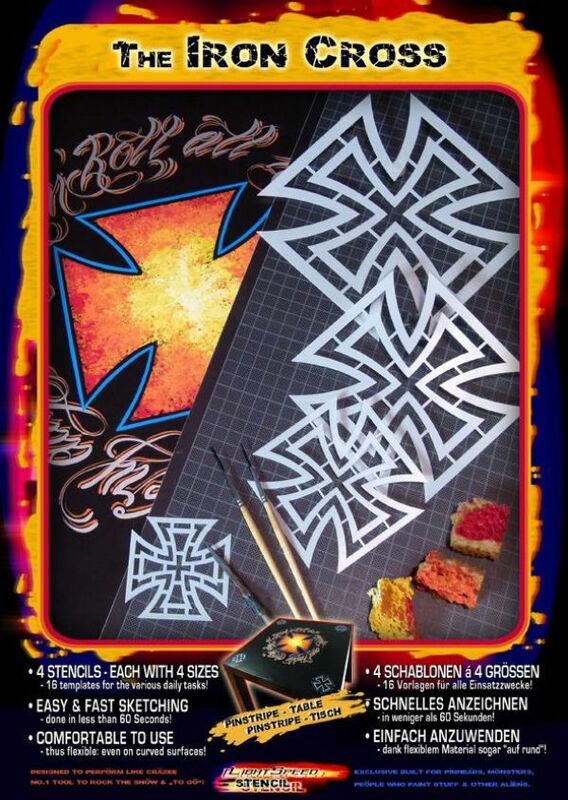 Trust in the quality and professionalism of Aerografando on the sale of 4 Stencils "Light Speed IRON CROSS" Harder&Steenbeck, only from us you will find the best prices. You want to have more details on 4 Stencils "Light Speed IRON CROSS" Harder&Steenbeck 410170 or more generally on ours Harder & Steenbeck? You are looking for a Harder & Steenbeck but do not you find it in the catalog? Staff of Aerografando will answer all your requests.